Starting with NetBackup 6.0, disk based images can be imported into NetBackup. The process for importing disk images is essentially the same as importing images from tape. The NetBackup Administration Console will have additional entries during the “phase one import” to allow selecting a disk path instead of a Media ID. In order to import disk based images, the images that were written to a disk storage unit must be present on the server. Copy the disk images to a directory on the server, or restore from a backup that contains the images from a disk storage unit. Once the files reside in a directory on the server, the NetBackup Administration Console or command line can be used to import the disk images. First, run the “phase 1 import”. 1. Start the NetBackup Administration Console and go to the Catalog section. 2. From the menu select Actions > Initiate Import and a dialog box will appear. 3. Check the “The images to be imported are on disk” radio button and enter a disk path to import images from. 4. Check the Activity Monitor for progress of the phase one import. Figure 1 shows the new Initialize Import screen. Once the “phase 1 import” completes, run the “phase 2 import”. 2. Under Pathname:, enter the disk path used for the phase 2 import. 3. Select a date range for the images to import and click the Search button. 4. Select Backup IDs to import from the search results. 5. From the menu select Actions > Import to begin the phase 2 import. 6. Check the Activity Monitor for progress of the phase 2 import. Once the phase 2 import completes successfully, the disk images will be available for restores. The command line utility bpimport can also be used to import images from a disk storage unit. This will use the “-id” option that was previously used to pass the media ID to use for the import. However, the “-id” option now supports passing either a disk path or a media ID. Enter the disk path to use for the import. Then, monitor the /usr/tmp/phase1.log file to monitor the progress of the phase 1 import. Enter the disk path to use for the import as well as the date range for the images to import. The format to use for the start and end dates is ‘MM/DD/YYYY hh:mm:ss’. Then, monitor the/usr/tmp/phase2.log file to monitor the progress of the phase 2 import. Once the phase 2 import completes successfully the disk images will be available for restores. It will not be possible to import disk images from a NetBackup 5.x server into NetBackup 6.0. This is due to a difference in the way disk images are handled in NetBackup 6.0. 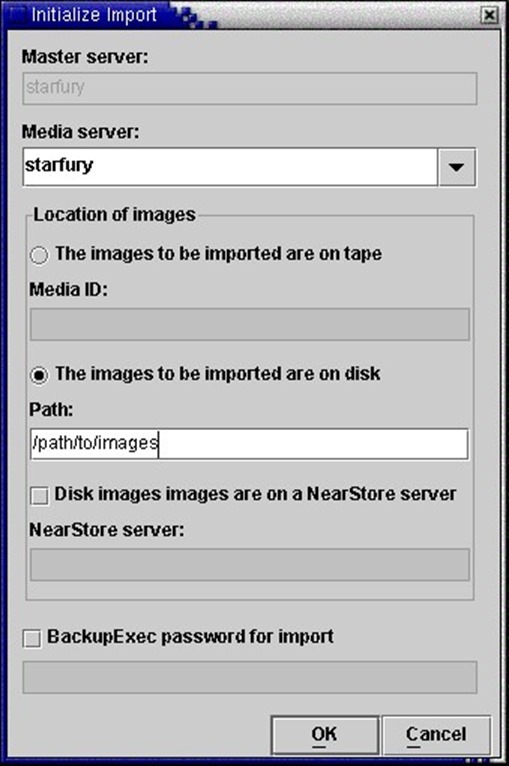 A phase 1 import of a directory that contains NetBackup 5.x disk images will fail with the message “INF – No importable NetBackup disk images found in path <path name>”. The activity monitor will show a Status 0 for the phase 1 import, even though no disk images are processed. Imports from a read only filesystem are not supported. Attempts to import from a read only filesystem will result in an “invalid disk header file” error.